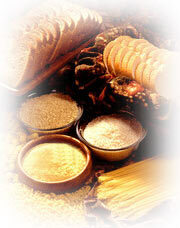 Carbohydrates are the human body’s key source of energy, providing 4 calories of energy per gram. When carbohydrates are broken down by the body, the sugar glucose is produced; glucose is critical to help maintain tissue protein, metabolize fat, and fuel the central nervous system. Glucose is absorbed into the bloodstream through the intestinal wall. Some of this glucose goes straight to work in our brain cells and red blood cells, while the rest makes its way to the liver and muscles, where it is stored as glycogen (animal starch), and to fat cells, where it is stored as fat. Glycogen is the body’s auxiliary energy source, tapped and converted back into glucose when we need more energy. Although stored fat can also serve as a backup source of energy, it is never converted into glucose. Fructose and galactose, other sugar products resulting from the breakdown of carbohydrates, go straight to the liver, where they are converted into glucose. Starches and sugars are the major carbohydrates. 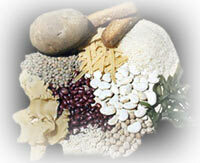 Common starch foods include whole-grain breads and cereals, pasta, corn, beans, peas, and potatoes. Foods that contain starches and naturally occurring sugars are referred to as complex carbohydrates, because their molecular complexity requires our bodies to break them down into a simpler form to obtain the much-needed fuel, glucose. Our bodies digest and absorb complex carbohydrates at a rate that helps maintain the healthful levels of glucose already in the blood. In contrast, simple sugars, refined from naturally occurring sugars and added to processed foods, require little digestion and are quickly absorbed by the body, triggering an unhealthy chain of events. The body’s rapid absorption of simple sugars elevates the levels of glucose in the blood, which triggers the release of the hormone insulin. Insulin reins in the body’s rising glucose levels, but at a price: Glucose levels may fall so low within one to two hours after eating foods high in simple sugars, such as candy, that the body responds by releasing chemicals known as anti-insulin hormones. This surge in chemicals, the aftermath of eating a candy bar, can leave a person feeling irritable and nervous. Many processed foods not only contain high levels of added simple sugars, they also tend to be high in fat and lacking in the vitamins and minerals found naturally in complex carbohydrates. Nutritionists often refer to such processed foods as junk foods and say that they provide only empty calories, meaning they are loaded with calories from sugars and fats but lack the essential nutrients our bodies need. In addition to starches and sugars, complex carbohydrates contain indigestible dietary fibers. Although such fibers provide no energy or building materials, they play a vital role in our health. 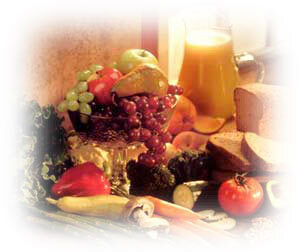 Found only in plants, dietary fiber is classified as soluble or insoluble. Soluble fiber, found in such foods as oats, barley, beans, peas, apples, strawberries, and citrus fruits, mixes with food in the stomach and prevents or reduces the absorption by the small intestine of potentially dangerous substances from food. 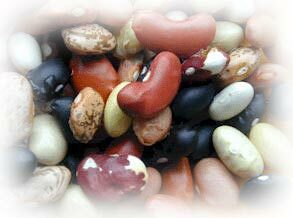 Soluble fiber also binds dietary cholesterol and carries it out of the body, thus preventing it from entering the bloodstream where it can accumulate in the inner walls of arteries and set the stage for high blood pressure, heart disease, and strokes. Insoluble fiber, found in vegetables, whole-grain products, and bran, provides roughage that speeds the elimination of feces, which decreases the time that the body is exposed to harmful substances, possibly reducing the risk of colon cancer. Studies of populations with fiber-rich diets, such as Africans and Asians, show that these populations have less risk of colon cancer compared to those who eat low-fiber diets, such as Americans. In the United States, colon cancer is the third most common cancer for both men and women, but experts believe that, with a proper diet, it is one of the most preventable types of cancer. Nutritionists caution that most Americans need to eat more complex carbohydrates. In the typical American diet, only 40 to 50 percent of total calories come from carbohydrates—a lower percentage than found in most of the world. To make matters worse, half of the carbohydrate calories consumed by the typical American come from processed foods filled with simple sugars. Experts recommend that these foods make up no more that 10 percent of our diet, because these foods offer no nutritional value. Foods rich in complex carbohydrates, which provide vitamins, minerals, some protein, and dietary fiber and are an abundant energy source, should make up roughly 50 percent of our daily calories.